Driving through Burford and stopped at the Antique centre on the side of the road to stretch legs and have a nose. 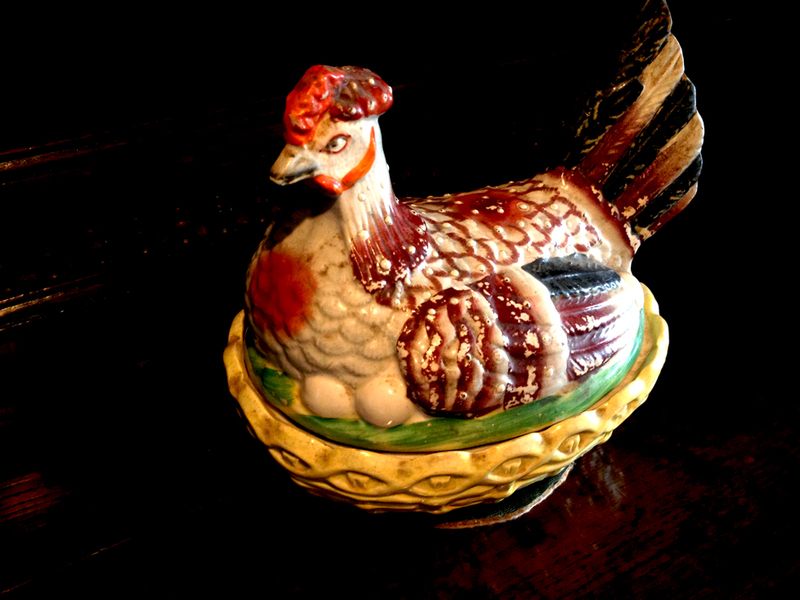 Fell in love with a great ceramic chicken egg basket. Wallet out I asked the owner for the price. “She’s not for sale” he said. “Oh” I said. Thinking that’s strange, this is a shop and in shops you display things you want to sell…. Resentment building in my tummy. – I’m a consumer – This is a shop – I live in a capitalist society – I am a capitalist – I WANT TO CONSUME – I WANT THE FRIGGING CHICKEN! “Is there no price you’d sell the Chicken for?” I forced through A clenched smile. “The chickens NOT FOR SALE” he stated bluntly. Visit the Antiques Centre Here – Don’t expect anything to be for sale though.